President Bush at the dedication of Flight 93 Memorial last night (get your kleenex). 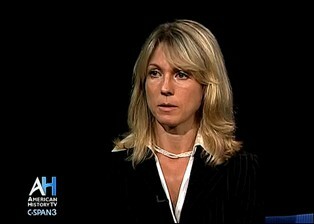 Go here, click "complete file" and watch this interview with Major Heather Penney, one of the jet pilots sent to intercept Flight 93 had Todd Beamer and his confreres not changed things up. Fast forward to about the 20 minute mark and listen to her tell you they had no missiles aboard (no time to mount them), so they were going to ram the plane. (Curtsy: American Digest). So much heroism from so many quarters. 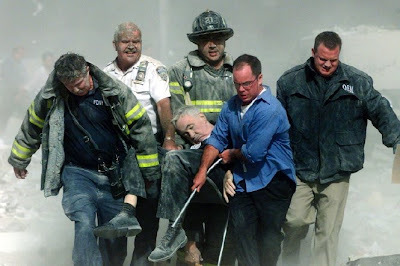 On this day my thoughts turn to the somber events of September 11, 2001, when so many innocent lives were lost in the brutal assault on the twin towers of the World Trade Center and the further attacks in Washington, D.C., and Pennsylvania. I join you in commending the thousands of victims to the infinite mercy of Almighty God and in asking our heavenly Father to continue to console those who mourn the loss of loved ones. The tragedy of that day is compounded by the perpetrators' claim to be acting in God's name. Once again, it must be unequivocally stated that no circumstances can ever justify acts of terrorism. Every human life is precious in God's sight and no effort should be spared in the attempt to promote throughout the world a genuine respect for the inalienable rights and dignity of individuals and peoples everywhere. The American people are to be commended for the courage and generosity that they showed in the rescue operations and for their resilience in moving forward with hope and confidence. It is my fervent prayer that a firm commitment to justice and a global culture of solidarity will help rid the world of the grievances that so often give rise to acts of violence and will create the conditions for greater peace and prosperity, offering a brighter and more secure future. Iconic photos of the day. Islam showed itself that day; so did Catholicism.